Spam filtering is enabled by default using 'Vade' for all DreamHost hosted email addresses in order to provide you with the best email experience possible. The filters scan incoming email and compares them against a set of rules or characteristics shared by spam emails. If the 'Vade' filter tags the email with a header of X-vr-status: Spam, it is filtered into your Spam folder. It's currently not possible to set up Spam filters with a legacy catch-all address. Blacklist entries are email addresses or domains you never want to receive email from. Emails from blacklisted senders are quarantined regardless of the email's spam score. If an email is sent to you from the blacklisted email, it simply never arrives in your Inbox. The sender does not receive a bounce message either, the message is just never delivered. Whitelist entries are email addresses or domains you always want to receive email from. Emails from whitelisted senders are delivered to the inbox regardless of the email's spam score. To Whitelist or Blacklist an address, navigate to the Anti-Spam page. To the right of your domain, click the Edit Filter button. 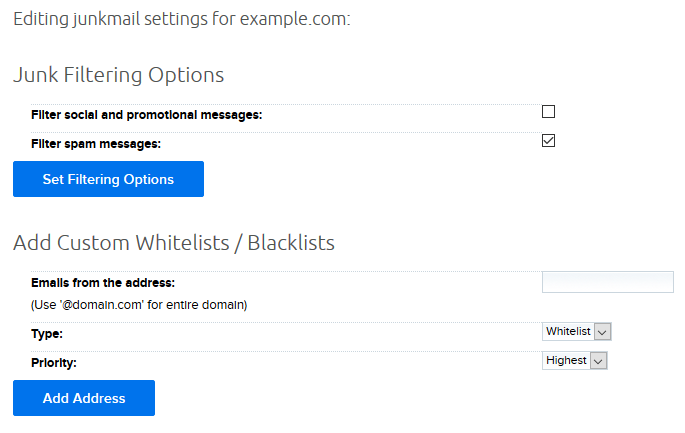 On the domain's email page, you have two options to create a Whitelist or Blacklist. Click the Edit settings for example.com button at the top of the page. This sets the SPAM domain as Blacklisted for all emails under your domain. To Whitelist or Blacklist an address for a specific email address (and not all emails on the domain), navigate to the Anti-Spam page. On the specific email address page, you can and 'Add Custom Whitelists/Blacklists'. When entering an email, it can be individual email addresses user@EXAMPLE.com or one entry to cover an entire domain @EXAMPLE.com. The limit is 1000 blacklist entries and 7500 whitelist entries. If you are getting close to that limit, consolidate multiple email addresses on a single domain with just one entry for the entire domain. All addresses must be entered manually. There is no bulk-import of addresses. Whitelist and blacklist entries apply to the envelope or SMTP sender, which does not always match the information in the 'From' details of the header. The envelope sender is often recorded in an email's full headers as the original sender or the return path. This is simply Whitelist or Blacklist. The priority of a whitelist or blacklist entry is generally ignored and only used when an incoming email could match more than one entry. All whitelist and blacklist entries are stored together and any incoming email is potentially compared against all of them. If there is only one black/white list entry for sender@EXAMPLE.com, and no entry for @EXAMPLE.com (meaning all senders on that domain), then the priority doesn't matter. The entry for sender@EXAMPLE.com is used. The priority comes in to play when there are multiple entries. The priority informs which entry takes precedence. If there is a tie, it is randomly chosen which entry is selected to route the email. All mail you get from 'example.com' is spam or chain letters; mail you don't ever want to read. But, there are plenty of important emails you do need to read from trusted mail senders that may be using 'example.com' as well. For example, let's say trustedsender@ needs to get through. In this case, you would create a blacklist entry for @example.com with the priority set to 'Low', then a separate whitelist entry for trustedsender@example.com with a higher priority. With that combination, emails from trustedsender@example.com will be handled by the higher priority whitelist entry, and all other emails from other senders using @example.com will be handled by the lower priority blacklist entry. The messages from ‘trustedsender@example.com’ will be delivered to the inbox despite the ‘@example.com’ domain being blacklisted due to priority settings. Navigate to the Anti-Spam page. Click 'Enable Filter' next to your domain (only shows for domains with active email hosting). Once you have enabled spam filtering on a domain, there is no way to reverse this action. It's currently not possible to disable spam filtering. However, it's possible to stop spam from being filtered into your /Spam folder. You just need to uncheck 'Filter spam messages' in the panel. Please note that this does NOT disable Vade filtering, it just prevents the email from going to the /Spam folder. It will then be sent to the inbox instead. To the right of your domain with filtering enabled, click the Edit Filter button. Click the Edit settings button for your domain. Uncheck the 'Filter spam messages' box. Click Set Filtering Options to save your settings. If you do not wish to use the anti-spam filtering feature that DreamHost offers through the panel, you have a few alternatives for filtering incoming mail before it's delivered to your hosted user with DreamHost. How do I enable message filters on my email address? You cannot set up these custom message filters on a domain-wide basis. They must be created for each user you want them applied to. You can set up third-party mail filtering services for your domain as well and have those filtering services deliver the mail to DreamHost mail servers once the filtering is complete. This can be setup through your account panel at Custom MX. Article last updated April 09, 2019 20:47 PST.